After my previous blog post about the FBI, Apple, and the San Bernadino iPhone, I’ve been reading many other bloggers and news articles on the topic. What seems to be missing is a decent analogy to explain the unusual nature of the FBI’s demand and the importance of Apple’s stance in opposition to it. Before I dive in, it’s worth understanding what the FBI’s larger goals are. Cyrus Vance Jr., the Manhattan DA, states it clearly: “no smartphone lies beyond the reach of a judicial search warrant.” That’s the FBI’s real goal. The San Bernadino case is just a vehicle toward achieving that goal. With this in mind, it’s less important to focus on the specific details of the San Bernadino case, the subtle improvements Apple has made to the iPhone since the 5c, or the apparent mishandling of the iCloud account behind the San Bernadino iPhone. When you check your bags in the airport, you may well want to lock them, to keep baggage handlers and other interlopers from stealing your stuff. But, of course, baggage inspectors have a legitimate need to look through bags. Your bags don’t have any right of privacy in an airport. To satisfy these needs, we now have “TSA locks”. You get a combination you can enter, and the TSA gets their own secret key that allows airport staff to open any TSA lock. That’s a “backdoor”, engineered into the lock’s design. What’s the alternative? If you want the TSA to have the technical capacity to search a large percentage of bags, then there really isn’t an alternative. After all, if we used “real” locks, then the TSA would be “forced” to cut them open. But consider the hypothetical case where these sorts of searches were exceptionally rare. At that point, the local TSA could keep hundreds of spare locks, of all makes and models. 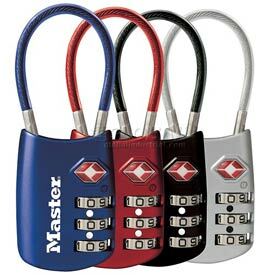 They could cut off your super-duper strong lock, inspect your bag, and then replace the cut lock with a brand new one of the same variety. They could extract the PIN or key cylinder from the broken lock and install it in the new one. They could even rough up the new one so it looks just like the original. Needless to say, this would be a specialized skill and it would be expensive to use. That’s pretty much where we are in terms of hacking the newest smartphones. Another area where this analogy holds up is all the people who will “need” access to the backdoor keys. Who gets the backdoor keys? Sure, it might begin with the TSA, but every baggage inspector in every airport, worldwide, will demand access to those keys. And they’ll even justify it, because their inspectors work together with ours to defeat smuggling and other crimes. We’re all in this together! Next thing you know, the backdoor keys are everywhere. Is that a bad thing? Well, the TSA backdoor lock scheme is only as secure as their ability to keep the keys a secret. And what happened? The TSA mistakenly allowed the Washington Post to publish a photo of all the keys, which makes it trivial for anyone to fabricate those keys. (CAD files for them are now online!) Consequently, anybody can take advantage of the TSA locks’ designed-in backdoor, not just all the world’s baggage inspectors. For San Bernadino, the FBI wants Apple to retrofit a backdoor mechanism where there wasn’t one previously. The legal precedent that the FBI wants creates a capability to convert any luggage lock into a TSA backdoor lock. This would only be necessary if they wanted access to lots of phones, at a scale where their specialized phone-cracking team becomes too expensive to operate. This no doubt becomes all the more pressing for the FBI as modern smartphones get better and better at resisting physical attacks. Where the analogy breaks down: If you travel with expensive stuff in your luggage, you know well that those locks have very limited resistance to an attacker with bolt cutters. If somebody steals your luggage, they’ll get your stuff, whereas that’s not necessarily the case with a modern iPhone. These phones are akin to luggage having some kind of self-destruct charge inside. You force the luggage open and the contents will be destroyed. Another important difference is that much of the data that the FBI presumably wants from the San Bernadino phone can be gotten elsewhere, e.g., phone call metadata and cellular tower usage metadata. We have very little reason to believe that the FBI needs anything on that phone whatsoever, relative to the mountain of evidence that it already has. Why this analogy is important: The capability to access the San Bernadino iPhone, as the court order describes it, is a one-off thing—a magic wand that converts precisely one traditional luggage lock into a TSA backdoor lock, having no effect on any other lock in the world. But as Vance makes clear in his New York Times opinion, the stakes are much higher than that. The FBI wants this magic wand, in the form of judicial orders and a bespoke Apple engineering process, to gain backdoor access to any phone in their possession. If the FBI can go to Apple to demand this, then so can any other government. Apple will quickly want to get itself out of the business of adjudicating these demands, so it will engineer in the backdoor feature once and for good, albeit under duress, and will share the necessary secrets with the FBI and with every other nation-state’s police and intelligence agencies. In other words, Apple will be forced to install a TSA backdoor key in every phone they make, and so will everybody else. While this would be lovely for helping the FBI gather the evidence it wants, it would be especially lovely for foreign intelligence officers, operating on our shores, or going after our citizens when they travel abroad. If they pickpocket a phone from a high-value target, our FBI’s policies will enable any intel or police organization, anywhere, to trivially exercise any phone’s TSA backdoor lock and access all the intel within. Needless to say, we already have a hard time defending ourselves from nation-state adversaries’ cyber-exfiltration attacks. Hopefully, sanity will prevail, because it would be a monumental error for the government to require that all our phones be engineered with backdoors.